3, 2, 1, GO! 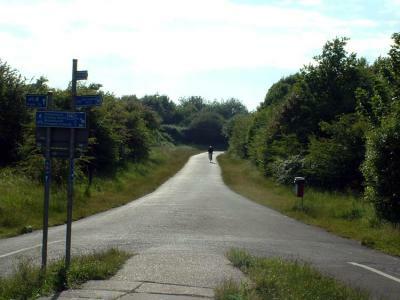 Begin by heading along a short grassy section before joining a gravel path which cuts through the common and leads to the tarmac zig-zag path to the Bristol - Bath Cycle Path. Heading in the direction of Bath, bear right at Mangotsfield Station and enjoy a mile of cycle path before ducking left through a narrow, wooded track and onto Siston Common. After a steady climb up the common, bear right through another narrow, wooded track, cross a field and enter Warmley Forest Park. Sticking to the field edge, gently descend then rise on a muddy path between the trees before descending again and heading towards a pond. To the right of the pond follow a gravel path alongside Siston Brook before emerging at a Scout Hut. A short trot on the Dramway and then divert back onto the Bristol - Bath Cycle Path, this time heading in the Bristol direction. After a cattle grid (passed earlier in the race), fork left and then pass under the A4174. Veering left off the tarmac, head across Siston Common to then cross Fisher Road (a dead-end street) and follow a footpath alongside Warmley Brook and another pond. Soon after a wooden footbridge, emerge near The Horseshoe Pub and take the underpass beneath Station Road Link to another part of Siston Common. The tarmac path will take you alongside football pitches before crossing Warmley Brook and bringing you back to Mangotsfield Station . Passing the bottom of the zig-zag, head right to a path below Rodway Common which emerges near the bottom of Manor Road before climbing some steps back to Rodway Common. 74 steps. Did you know about the steps? Oh, well, let's move on. The race route now takes you across the common, back to the Start straight before your second descent of the zig-zag. Heading towards the station again, fork left this time and soon duck left into Pomphrey Hill Playing Fields. Pass another pond, this time on the right and then climb uphill towards the back of Mangotsfield School. Head into the grounds of the school, keeping to the left before joining the running track for half a bend and a 100m straight (with thoughts of Rio 2016). Leave the track, turn left then right and it's about 100m to the Finish. Job Done!